Maxi Hair® Plus is the newest complement to the long-standing original favorite, MAXI-HAIR®. It is formulated with B vitamins, biotin and MSM, and brings life back to your hair, skin and nails. 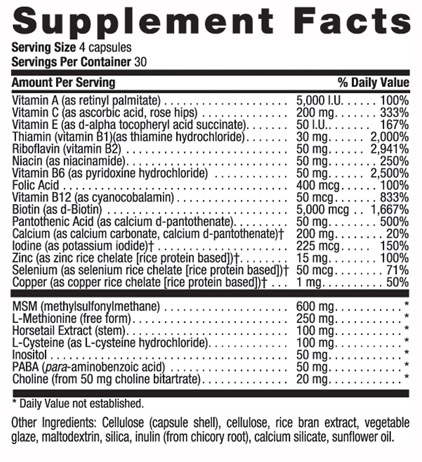 Maxi Hair® Plus (in vegetarian capsules) contains 5 mg (5,000 mcg) of biotin. RECOMMENDED USE: Adults take four (4) capsules daily. For best utilization, take with food. Contains NO: gluten, wheat, soy, milk, preservatives, artificial colors, flavors or sweeteners or magnesium stearate. CAUTION: Consult physician before using if you are pregnant, lactating, using blood thinners, anticipate surgery or are taking multiple medications. Not recommended for people who regularly consume liver. Other Ingredients: Cellulose (capsule shell), cellulose, rice bran extract, vegetable glaze, maltodextrin, silica, inulin (from chicory root), calcium silicate, sunflower oil.